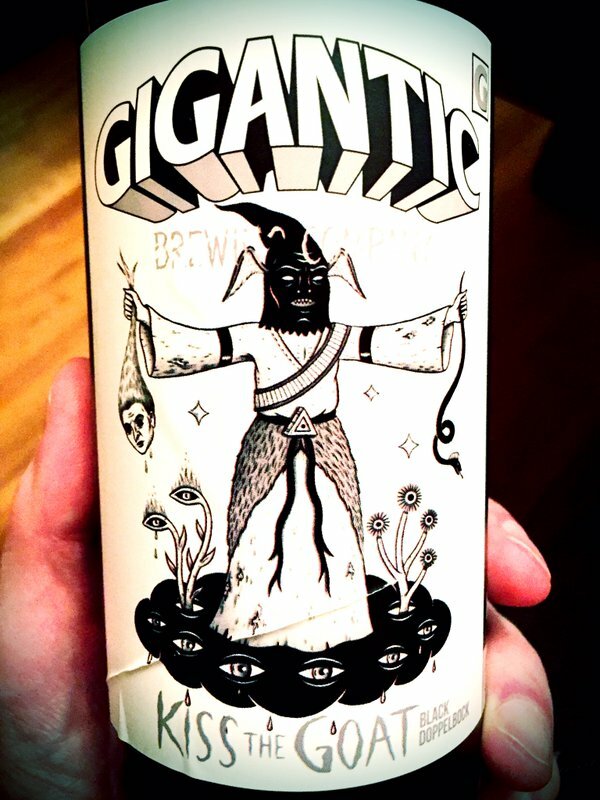 Gigantic Brewing has one of the more interesting approaches to beer in America. Their regular line of year-round beer consists of exactly one brand: IPA. Everything else they make appears just once (almost all of them) or annually (Massive! is the only example I can recall of a recurring beer.) They number each new release and contract with a well-known artist to create the label. Sometimes they even have an associated musical tie-in. This would seem to violate all the rules of branding and brand-building I know: there's no consistency across either beers or labels, and each bottle is a crapshoot for their customers. If one of these beers becomes a treasured fan favorite, too bad: you'll never get to taste it again. And yet as far as I can tell the brewery is flourishing. Brewers/owners Van Havig and Ben Love are doing so well that half the time they seem to be in Tokyo or Turin promoting their latest project. I have loved three or four of the 39 editions of this experiment and probably disliked twice that number. (The rest I enjoyed in varying degrees.) This means Gigantic is the perfect brewery for the Beer Sherpa: when a good one comes along, it's almost mandatory that I point it out. But a new Gigantic beer is a multimedia release, too, and the label earns this special Sherpa attention as one of the most entertaining in recent memory. The artwork is by Portlander Jon MacNair and features a TTB-defying scene of dark happenings. It recalls the 1980s basements of my teenage youth. The soundtrack to those years was often the kind of silly metal that scared Tipper Gore--and which sounded a lot like the accompanying 7" single Sons of Huns created specially for this beer. (You might think Clyfford Still, who is quoted on the label praising the color black, is connected somehow to Aleister Crowley, but in fact he's an American abstract expressionist.) Pure sensory pleasure, from eye to ear to tongue, this fine beer supplies in spades. You definitely want to track down a Kiss the Goat or three. This is one of the Gigantic beers we'll miss when it's gone. Sounds great but also sounds, unfortunately, like it will have disappeared before I get there this year. I can't believe how Gigantic have grown. I visited the brewery shortly after it opened and, whilst enjoying the beer immensely, had no idea that they would become so renowned for their niche products. Ginormous seems to be pretty regular, and I think they brought back Most Premium this year too. Kiss the Goat was on draft several years back, so not the first time they've made it, just the first time they've bottled it. It was fantastic back then, too. Also, I second the Royale. That beer was sublime.